Embroidery is actually an art in which materials are decorated such as fabrics with the help of a needle and a thread. It also includes other materials such as pearls, beads, quilts, sequins etc. Today, basic embroidery designs are seen on shirts, on caps, hats, coats, jackets, blankets, denim, etc. It is an art which needs to be appreciated well since it requires hard work and we can see it daily around us. One of my friends, Mathilda presents her embroidery art for sale. She lives in Iran and gets enough income for her supper. Although she did not get enough time to join some industry and win a good earning. So, she used to supply her embroidery designs at a local shop in Mashhad. 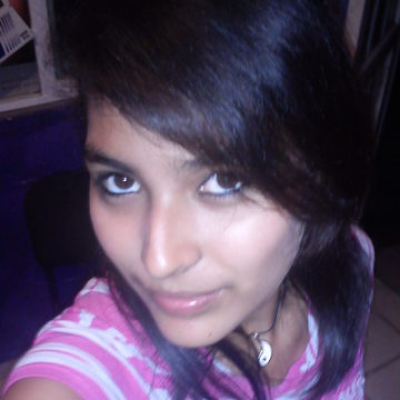 I found her on a Facebook group. I told her that I buy embroidered fabrics online from ShowFlipper. During our chat, she told me about her earnings. I was happy that my new friend has knowledge about embroidery. 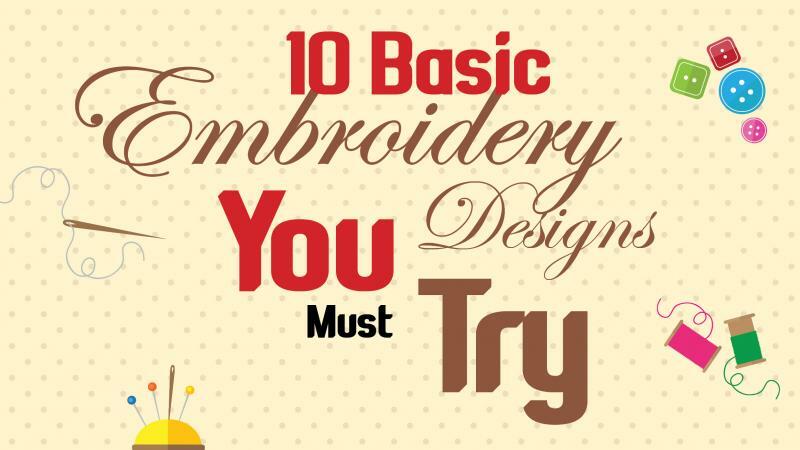 On showing my interest, she told me the 10 basic embroidery designs to try at home. Are you having a tea party? But there are no embroidered napkins? You can make them in no time. Just take some fabric and divide it into the size you want to create your napkins. Now draw a pattern and start to do embroidery on it. It will cost you about 1$ and it will result in hundreds of cute napkins. You can always opt for darker or lighter shades. The most beautiful hand embroidery napkins for me are white fabric and baby pink embroidered flower. If you master this art, you can sell embroidery online too at this online hand embroidery shop. You can always start with a zigzag border for your stuff. Whatever you are doing, a napkin or a table mat, or a scarf, you can create a decent border with this zigzag design. You can check in stores where this style is presented for sale. Watching the embroidery of others will give you an immense idea about the do’s and don’ts of the embroidery. As one of the basic embroidery designs, you can create patterns of embroidery with basic shapes like circle, square, triangle, rectangle, star, and an oval. You can use these shapes as you like. Like, you can use the circle pattern which has various circles connected with each other and so, creates a bubble design. Mathilda used this embroidery art design on shirts and presented them for sale in her local market. It was highly appreciated by the customers. Similarly, triangles connected together can create a beautiful embroidery art for sale. Joining together the rectangle, stars, ovals with circles and ovals, they will all make symmetry. I have a scarf which has the basic shapes embroidered all over the fabric. It looks awesome and matches with any personality. What? A henna design on fabric? You can opt for henna designs on your fabric. If you go to some hand embroidery shop, you will find the fabrics which have been embroidered with henna designs. The designs will look fantastic and it will give you an immense payback if you will present this embroidery art for sale. This amazing combination is although one of the basic embroidery designs, it looks really nice when you put it in your showcase for sale online and it is sold like hot cakes. People love to buy this unique design. Among the fabric arts, cheetah design is the most demanding. The cheetah design is a very usual pattern to create and very hot one for sale on hand embroidery shop. You can go for small, medium and large designs in this category. You can opt for a golden brown or orange fabric ideally. The embroidery may be black or coffee brown as your choice. This embroidery design supports your versatile approach. It may adopt various shades like black and mauve, pink and purple, red and black contrasts. The designs with fruits can also attract the attention of viewer. You can fill in your fruits with poly embroidery if you like them to give a bold impression. Mathilda once presented a shirt as embroidery art for sale at $500 which had strawberry embroidery all the way over the shirt. According to Mathilda’s experience tells about the buyer\'s attraction. She says that, if you want people to buy embroidered fabrics online, you should dare to give them something unique. Provide them your expertise, which they cannot find easily in the market. You can apply accessories to the creation which are the center of attraction for the females. You can go for diamonds, emeralds, ruby or a sapphire. Your embroidery art will be sold instantly on the hand embroidery shop if you do this hack in your hand embroidery. Musical venture can be applied fabric art as well. Select the musical instruments you find eye-catching and embed their design upon your fabric by drawing their pattern. 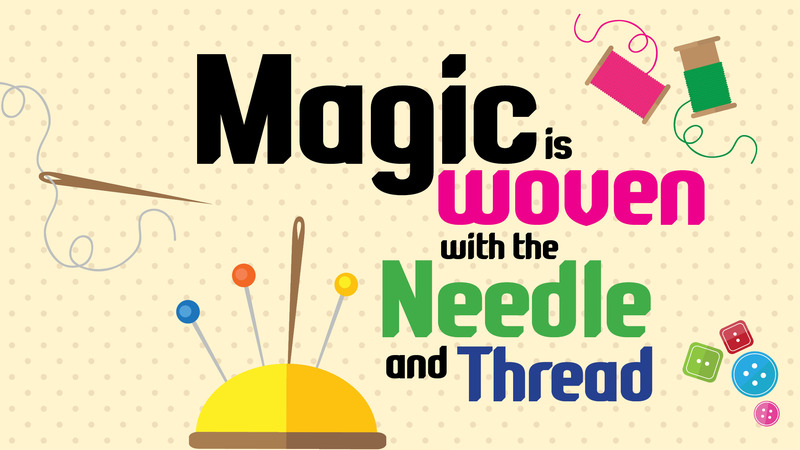 Now follow them with your needle, thread, and beads. It will create a terrific hand embroidery masterpiece for sale online. You can get ready made hand embroidery fabrics online on Showflipper. Travelling will never be apart from human nature. Hand embroidery which has a scenery, beaches or a hill station view would look great. By all means, handmade embroidery is a great source of earning. The people who are fond of these real handmade embroideries, follow their heart to buy them irrespective of the prices. You can buy these embroidery designs online. Showflipper is an online gallery from where you can get these. To explore more, go to the fabric art section of Showflipper.